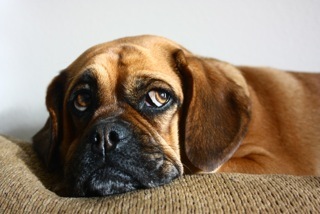 We just received an absolutely heartbreaking email from a military wife (well, ex military wife) who needs to rehome her beloved puggle, Brooke. In order to help her, we need a foster home in the San Diego area. Please contact us at mdgrrrl@msn.com if you can open your home and your heart to this little beauty. Brooke is 4 yrs old, UTD on shots, spayed, housetrained, good with kids and cats. Used to living a very active lifestyle – regular walks and roller-blading excursions with her mama, but has had to move into an apartment through no fault of her own and has become very depressed. We really really want to help this sweet girl, and her mom. Please consider being a temporary home for her during this difficult transition. I found your website via Lilly the Hero Pitt-bull’s Facebook page! I’m just reading through some of your posts and was wondering if this little one ever found a good home? 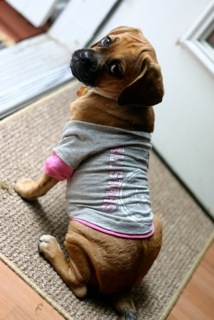 I have a six year old puggle named Lily who looks very similar to Brooke! Yes, everything has worked out for Brooke, thank you for checking! « Ed E Hopps – ADOPTED! !